Can the castle on the hill be saved? 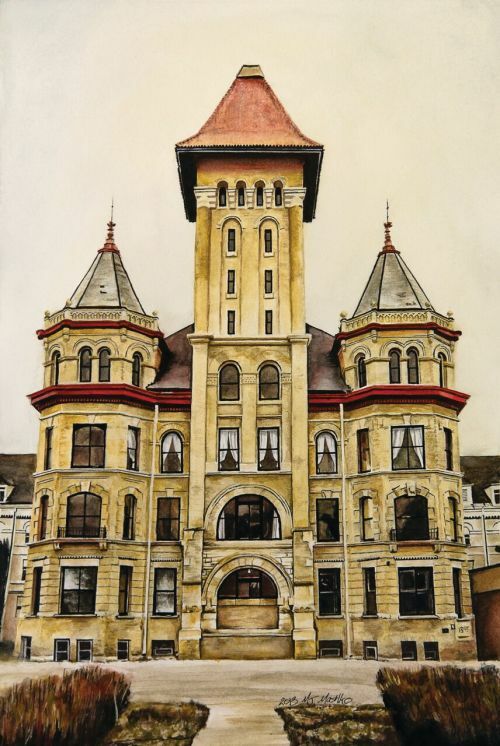 Sometimes referred to as “the castle on the hill,” the former Fergus Falls Regional Treatment Facility, also known as the Kirkbride building, has inspired, shocked, awed, inspired and provided economic stability to the community of Fergus Falls, Minnesota, for well over a century. It served as a treatment facility, housed the mentally ill and developmentally disabled, eventually closed its doors in 2005 and has been empty ever since. It once supported farmland, lush orchards and livestock barns, creating a sustainable community that included a newspaper, an auto shop, a chapel and Minnesota’s first in-institution beauty parlor. Not only did it provide refuge for those who needed it. It is a historical and architectural gem and, I daresay, the crown jewel of Fergus Falls. I had the opportunity to take a tour a number of years ago, the last tour that went through the facility. I was in awe of its scale, its neoclassical architecture, and the possibilities of what it could house -- provided the right investor or investors came along. I also can’t help but wonder: if those walls could talk, what stories would they tell? Dr. Thomas Story Kirkbride, was a founding member of the Association of Medical Superintendents of American Institutions for the Insane (AMSAII) in the latter part of the 19th century. He was the mastermind and therefore namesake behind the “Kirkbride Plan” which involved moral treatments and stressed the importance of fresh air and natural light to the healing process of the patients housed within. He directly influenced the design of the asylums named after him. After his first wife’s death, Dr. Kirkbride even married a former patient, thus proving his belief in patient recovery. Sure, there were significant horrors and unpleasantness within those walls, but the community of Fergus Falls treasures its Kirkbride building. They embrace the positive impact that the facility has had upon their community, and hold an annual community-wide art and history weekend during the summer in which they embrace the legacy of the Kirkbride through music, visual art, and theatre. Lowell Carpenter, a retired English/Drama instructor, is the author of “Walking the Tightrope.” Carpenter utilized excerpts from “The Weekly Pulse,” the paper written and published by the hospital staff, and a diary from a patient that was donated to the museum in 2010. The production featured original music and local cast members. Some of my favorite anecdotes heard on the short tour we took were stories of dances, bands and socials that were once held on the lawn of the facility for the patients. The people who host the Art and History Weekend aren’t single weekend warriors, mind you Springboard for the Arts hosts an artist residency program and has opened its doors to artists across the nation, putting Fergus on the map as a creative hub. I grew up in Jamestown, which is somewhat similar to Fergus. It’s around the same size and is home to the North Dakota State Hospital, which is still in use and was built around the same time as the Kirkbride. The State Hospital in Jamestown still continues to provide jobs and treatment options to members of the community, but wasn’t viewed as positively as the Kirkbride. That quote resonated within me. It’s important to know your local history and to embrace it. It’s what makes our communities unique and creates a dialog that can be passed on to future generations.